Attachment theory is a comprehensive theory of development (social and emotional), motivations, personality and psychopathology. The theory deals with the intimacy in relationships and the role of attachment across one’s lifespan. Attachment refers to the lasting bond an individual has with another who satisfies his need for comfort and safety from dangers. According to John Bowlby, humans are born with a set of behaviors (attachment) that help ensure closeness to a comforting, protecting figure (attachment figure). These attachment processes affect human beings throughout the course of their life. The theory of relationships and personality differences has two components – normative (explains the stages of development through which all human beings pass and the typical patterns of behavior) and an individual difference component (explains the stable, systematic deviations from the model behavioral patterns and strategies). Attachment is an evolutionary response to an infant’s distress when faced with an uncertain world filled with dangers. Seeking comfort, the infant tries to gain the attention of the attachment figure by crying, pleading and crawling to the attachment figure. This responsive caregiver eventually becomes the object of the infant’s primary attachment bond, the one the child turns to in times of uncertainty. The caregivers can be any member of the family, close family friends, neighbors, a nanny, etc. This forms the earliest interpersonal experience of a human being. The strength of the attachment bond is determined by how the caregiver interacts with the child. A strong bond represents a sensitive warm, responsive, consistent caregiver. A weak, unhealthy bond signifies a distant cold, unavailable or inconsistent caregiver. Caregivers are the earliest form of social interaction and help socialize individuals about how to manage their social and interpersonal relationships. In this phase bonds are no longer formed with caregivers as their presence slowly reduces. Adolescents and adults start turning to a specific individual when they need affirmation related to security, intimacy or when stressed. Methods to establish contact involve talking to someone on the telephone, sending an email or a text message or mentally remembering soothing representations of attachment figures. Attachments occur with close friends, siblings, etc. As they grow older it may also be teachers or even God. The strongest bond though is the romantic pairing of two individuals which is cemented through dating and finally committing to each other. This phase is characterized by an enduring relationship or state of belonging with an attachment figure through good and bad episodes in the relationship. The bond is so enduring that if the relationship is broken grief and loss occurs. According to Bowlby, interactions with the attachment figure influence a person greatly in all close relationships during adulthood, in parenting and in peer and romantic relationships. Early relationship experiences have significant impact on one’s manner of navigating one’s social world. Individuals develop their own style of interacting with their significant one. Experiences result in the development of ideas of trust, affections, closeness, and intimacy related behaviors. 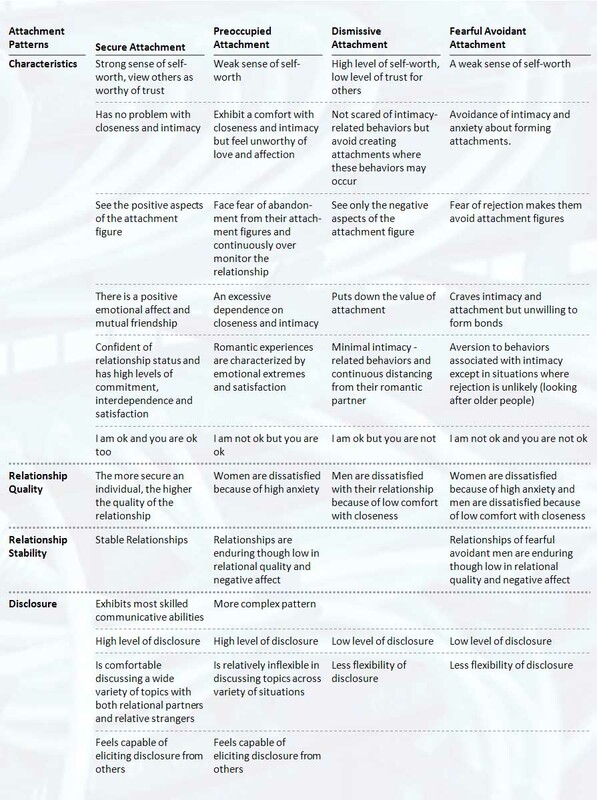 Expressions of these individual differences are grouped into four attachment styles or patterns which influence process and outcomes regarding how one acts or is intimate within many close or romantic relationships. A pattern is characterized by an evaluation by self and others. Patterns may change subtly throughout the course of one’s life. The pattern of an individual’s relational partner may also influence how he/she expresses his attachment pattern. This eventually impacts whether they are chosen as a relational partner or not. Patterns also impact personal communications within a relationship. Attachment research focuses on the similarities and differences between the affective, cognitive, behavioral and social attributes of individuals displaying the below patterns. When the primary attachment figure is unavoidable and unresponsive, the distress that first sought proximity is compounded by serious attachment related doubts. Secondary attachment strategies are then used.